Words of faith can be found in many ways - from bible verses, from prayers, from poems, and in messages. We hope you find words that inspire and encourage you here. Inspirational Prayers - Prayer is one of the best ways to talk with God. Inspirational Sayings - Sayings to inspire and start your day on a positive note. Christian Poems - Uplifting verses that to strengthen your faith. 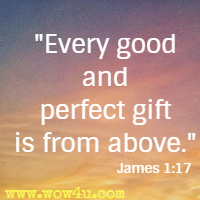 Inspirational Messages - About God, faith and overall inspiration to encourage you. 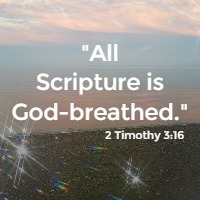 Encouraging Bible Verses - There is no better encouragement than from the Word of God. 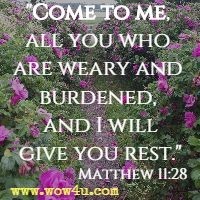 Christian Quotes - Quotes to inspire all Christians. Unstoppable faith is all about both believing and achieving. It's about having faith in yourself, your talents, your purpose, and, most of all, in God's love and His divine plan for your life. You must believe that God is separate from the world and that some of the things we see in it are contrary to His will. In the greatness of our troubles there may often be space for the greater display of the goodness of God! Faith is not the belief that God will do what you want. Faith is the belief that God will do what is right. Only God could have put the Bible together. It contains 66 books written over 1,600 years by 40 authors - and it has one theme. "If then God so clothe the grass, which is today in the field, and tomorrow is cast into the oven; how much more will he clothe you, O ye of little faith? 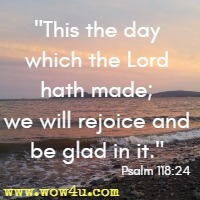 "This the day which the Lord hath made; we will rejoice and be glad in it." "His compassions never fail. They are new every morning." "Your words are trustworthy, and you have promised these good things." The rich man took no notice, he turned his face away. His eyes were never focused on someone else's need. Fine clothes, great food, his mansion, he'd never known strife. He seemed to have one motto, "In life get all you can." While Lazarus in his poverty felt lonely and depressed. But money can't buy health and love - one day the rich man died. All the things he'd treasured so, in death were set aside. And when he realized his plight, he pleaded for God's grace. Hell will not set its souls at ease, these plans cannot be turned. And angels gently brought his soul to where all saved men dwell. His soul renewed, his spirit healed, his body made complete. Discarded as an outcast, discouraged and forlorn. After years of turmoil, his soul had found relief. He longed for cool, clear water to quench his terrible thirst. And then expect forgiveness; that God should clear our slate. The message of salvation is there for all to know. Don't imitate the rich man who threw his soul away! He'll grant abundant blessings because He cares for you. We would forever walk in fear, our day as dark as night. 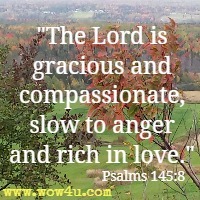 Compassion for His wayward child, to whom He shows great care. We would forever search for peace and yet we'd stand alone. We'd relish treats it has in store, rewards that we'd call treasures. There'll be some situations where we can't find our way. 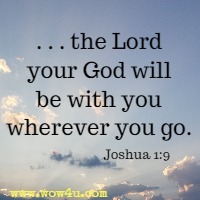 Man makes his own decisions, but God is always near. To God each place on earth is known, right to the smallest enclave. Repentant we can come to Him, with deep, sincere contrition. He’ll teach us how to walk with Him, beginning with each new day. To those who read His Word, obey; there’s grace, each day, each hour. I’m feeble, easily broken; I'm in a sorry state. And yet I'm not defeated though folks my use deride. Not I, but Jesus in me, my value can renew. They’re unaware of value in God's eternal plan. That’s given to the lowly in God's triumphant hour. The vessel, once deemed useless, is granted a new start. The cleansing power of Jesus has freed this soul of sin. Reclaimed to be of service, yes, service for the Lord. Find contentment as you bow before His face. See His faithfulness and keep your trust in Him. Where instructions are assigned for each new day. 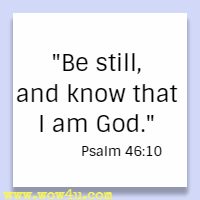 Sit and listen as He speaks with "Peace be still." Trusting that it's on His grace you can depend. Sweet serenity within His bosom lies.